KALAMAZOO, MI - In the finale of the regular 2018 season, the Kalamazoo Growlers silenced the Battle Creek Bombers' bats early, clinched the OnStaff I-94 Rivalry Cup, and proved to be contenders in the South Division playoffs. 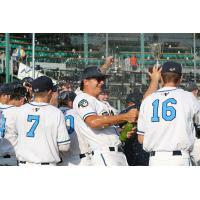 The Growlers came to play on the sunny Sunday afternoon as they took to the bases early. Jonathan Foster started it off with a sac fly to score Zach Daniels providing a 1-0 lead in the bottom of the first inning. The Bombers retorted with a run of their own, starting with a leadoff double from Shane Easter who would then score on a Daniels' error in the top of the second to tie the game at one. Roman Trujillo reached second base on the same error and eventually scored from an Alec Cargin sac fly to make the game 2-1. In the bottom of the third, Kalamazoo found what they had spent the whole second half looking for. It all started with a walk and a stolen base from Kawambee Moss. Zach Daniels mirrored Moss' mojo by also walking and stealing a base of his own. Matt Mervis loaded the bases with no outs to set up Jonathan Foster for his RBI. This was Foster's second sac fly of the day to score Daniels in mirrored fashion as the first, tying the game at two. Niko Kavadas found his rhythm with an easy two run RBI single and allowed the Growlers a decent lead at 4-2. He found his way to third, Jarett Smetana singled, and Anthony Cocco sacrificed his body to loaded the bases. Smetana then advanced to third on Jared Miller's flyout and scored on a wild pitch. The fifth inning looked familiar with walks and stolen bases from Moss and Daniels. Mervis found himself an RBI and adding to the lead. Smetana's bat was still hot when he singled to score two more runs. Cocco proved to be the hero of the inning with a bases clearing triple. Moss would conclude the scoring streak with an RBI single to end the inning at a comfortable 12-2 lead. Two more runs were added in the sixth when Moss singled to centerfield. Battle Creek had an error that let two runs score for Kalamazoo. George Mendazona found himself crossing home plate after the Zach Daniels' putout. Matt Mervis hit a two-run bomb to right field to score two more runs and extend the lead to 17-2.